"Brünn" redirects here. For other uses, see Brunn. Brno (/ˈbɜːrnoʊ/ BUR-noh; Czech: [ˈbr̩no] ( listen); German: Brünn [bʁʏn]) is the second largest city in the Czech Republic by population and area, the largest Moravian city, and the historical capital city of the Margraviate of Moravia. Brno is the administrative center of the South Moravian Region in which it forms a separate district (Brno-City District). The city lies at the confluence of the Svitava and Svratka rivers and has about 400,000 inhabitants; its greater metropolitan area is home to more than 800,000 people while its larger urban zone had a population of about 730,000 in 2004. Brno is the seat of judicial authority of the Czech Republic – it is the seat of the Constitutional Court, the Supreme Court, the Supreme Administrative Court, and the Supreme Public Prosecutor's Office. The city is also a significant administrative centre. It is the seat of a number of state authorities, including the Ombudsman, and the Office for the Protection of Competition. Brno is also an important centre of higher education, with 33 faculties belonging to 13 institutes of higher learning and about 89,000 students. Brno Exhibition Centre ranks among the largest exhibition centres in Europe (23rd in the world). The complex opened in 1928 and established the tradition of large exhibitions and trade fairs held in Brno. Brno hosts motorbike and other races on the Masaryk Circuit, a tradition established in 1930, in which the Road Racing World Championship Grand Prix is one of the most prestigious races. Another cultural tradition is an international fireworks competition, Ignis Brunensis, that usually attracts tens of thousands of daily visitors. The most visited sights of the city include the Špilberk castle and fortress and the Cathedral of Saints Peter and Paul on Petrov hill, two medieval buildings that dominate the cityscape and are often depicted as its traditional symbols. The other large preserved castle near the city is Veveří Castle by Brno Reservoir. This castle is the site of a number of legends, as are many other places in Brno. Another architectural monument of Brno is the functionalist Villa Tugendhat which has been included on the UNESCO list of World Heritage Sites. One of the natural sights nearby is the Moravian Karst. The city is a member of the UNESCO Creative Cities Network and has been designated as a "City of Music" in 2017. The etymology of the name Brno is disputed. It might be derived from the Old Czech brnie 'muddy, swampy.' Alternative derivations are from a Slavic verb brniti (to armour or to fortify) or a Celtic language spoken in the area before it was overrun by Germanic peoples and later Slavic peoples (this theory would make it cognate with other Celtic words for hill, such as the Welsh word bryn). Throughout its history, Brno's locals also referred to the town in other languages, including Brünn in German, ברין (Brin) in Yiddish and Bruna in Latin. The city was also referred to as Brunn (/brʌn/) in English, but this usage is not common today. The Asteroid 2889 Brno was named after the city, as well as the Bren light machine gun (Brno + Enfield), one of the most famous weapons of World War II. The Brno basin has been inhabited since prehistoric times, but the town's direct predecessor was a fortified settlement of the Great Moravia Empire known as Staré Zámky which was inhabited from the Neolithic Age to the early 11th century. In the early 11th century Brno was established as a castle of a non-ruling prince from the House of Přemyslid, and Brno became one of the centres of Moravia along with Olomouc and Znojmo. Brno was first mentioned in Cosmas' Chronica Boëmorum dated to year 1091, when Bohemian king Vratislav II besieged his brother Conrad at Brno castle. In the mid 11th century, Moravia was divided into three separate territories; each one of them had its own ruler, coming from the Přemyslids dynasty, but independent of the other two, and subordinated only to the Bohemian ruler in Prague. Seats of these rulers and thus "capitals" of these territories were castles and towns of Brno, Olomouc, and Znojmo. In the late 12th century, Moravia began to reunify, forming the Margraviate of Moravia. Since then, until the mid of the 17th century, it was not clear which town should be the capital of Moravia. Political power was therefore "evenly" divided between Brno and Olomouc, but Znojmo also played an important role. The Moravian Diet (cz: Moravský Zemský sněm), the Moravian Land Tables (cz: Moravské Zemské desky), and the Moravian Land Court (cz: Moravský Zemský soud) were all seated in both cities at once. However, Brno was the official seat of the Moravian Margraves (rulers of Moravia), and later its geographical position closer to Vienna also became important. Otherwise, until 1642 Olomouc was larger than Brno by population, and it was the seat of the only Roman Catholic diocese in Moravia. Unsuccessful Swedish siege in 1645. In 1243 Brno was granted the large and small city privileges[clarification needed] by the King, and thus it was recognized as a royal city. In 1324 Queen Elisabeth Richeza of Poland founded the current Basilica of the Assumption of Our Lady which is now her final resting place. In the 14th century, Brno became one of the centres for the Moravian regional assemblies, whose meetings alternated between Brno and Olomouc. These assemblies made political, legal, and financial decisions. Brno and Olomouc were also the seats of the Land Court and the Land Tables, thus they were the two most important cities in Moravia. From the mid 14th century to the early 15th century the Špilberk Castle had served as the permanent seat of the Margraves of Moravia (Moravian rulers); one of them was elected the King of the Romans. In the 15th century Brno was besieged in 1428 and again in 1430 by the Hussites during the Hussite Wars. Both attempts to conquer the city failed. In 1641, in the midst of the Thirty Years' War, the Holy Roman Emperor and Margrave of Moravia Ferdinand III commanded permanent relocation of the diet, court, and the land tables from Olomouc to Brno, as Olomouc's Collegium Nordicum made it one of the primary targets of Swedish armies. In 1642 Olomouc surrendered to the Swedish army which then stayed there for 8 years. [note 1] Meanwhile, Brno, as the only Moravian city which under the leadership of Jean-Louis Raduit de Souches managed to defend itself from the Swedes under General Lennart Torstenson, served as the sole capital of the state (Margraviate of Moravia). After the end of the Thirty Years' War (1648), Brno retained its status as the sole capital. This was later confirmed by the Holy Roman Emperor Joseph II in 1782, and again in 1849 by the Moravian constitution. [note 2] Today, the Moravian Land Tables are stored in the Moravian Regional Archive, and they are included among the national cultural sights of the Czech Republic. In December 1805 the Battle of Austerlitz was fought near the city; the battle is also known as the "Battle of the Three Emperors". Brno itself was not involved with the battle, but the French Emperor Napoleon Bonaparte spent several nights here at that time and again in 1809. In 1839 the first train arrived in Brno from Vienna, this was the beginning of rail transport in what is now the Czech Republic. In the years 1859-1864 the city fortification was almost completely removed. In 1869 a horsecar service started to operate in Brno, it was the first tram service in what would later become the Czech republic. Gregor Mendel conducted his groundbreaking experiments in genetics while he was a monk at St. Thomas's Abbey in Brno in the 1850s. Main railway station in 1901. Around 1900 Brno, which until 1918 consisted in administrative terms only of the central city area, had a predominantly German-speaking population (63%), as opposed to the suburbs, which were predominantly Czech-speaking. Life in Brünn/Brno was therefore bilingual, and what was called in German "Brünnerisch" was a mixed idiom containing elements from both languages. In 1921 Brno became the capital of the Land of Moravia (Czech: země Moravská); before that it was the capital of the Margraviate of Moravia. Seven years later, Brno became the capital of the Land of Moravia-Silesia (Czech: země Moravskoslezská). In 1930, 200,000 inhabitants declared themselves to be of Czech, and some 52,000 of German nationality, in both cases including the respective Jewish citizens. Between 1941 and 1942, transports from Brno deported 10,081 Jews to Theresienstadt (Terezín) concentration camp. At least another 960 people, mostly of mixed race, followed in 1943 and 1944. After Terezín, many of them were sent to Auschwitz concentration camp, Minsk Ghetto, Rejowiec and other ghettos and concentration camps. Although Terezín was not an extermination camp, 995 people transported from Brno died there. After the war only 1,033 people returned. Industrial facilities such as arms factory Československá zbrojovka and aircraft engine factory Zweigwerk (after the war it became Zbrojovka's subsidiary Zetor) and the city centre were targeted by several Allied bombardment campaigns between 1944 and 1945. The air strikes and later artillery fire killed some 1,200 people and destroyed 1,278 buildings. After the city's occupation by the Red Army on 26 April 1945 and the end of the war, ethnic German residents were forcibly expelled. In the so-called Brno death march, beginning on 31 May 1945, about 27,000 German inhabitants of Brno were marched 40 miles (64 kilometres) to the Austrian border. According to testimony collected by German sources, about 5,200 of them died during the march. Later estimates by Czech sources put the death toll at about 1,700, with most deaths due to an epidemic of shigellosis. At the beginning of the Communist era in Czechoslovakia, in 1948, the government abolished Moravian autonomy and Brno hence ceased to be the capital of Moravia. 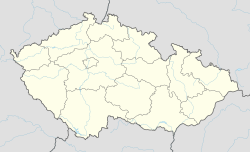 Since then Moravia has been divided into administrative regions and Brno is administrative centre of the South Moravian Region. Air quality in the Czech Republic in 2008, Brno ranks among the cleanest cities. Brno is located in the southeastern part of the Czech Republic, at the confluence of the Svitava and Svratka rivers and there are also several brooks flowing through it, including the Veverka, Ponávka, and Říčka. The Svratka River flows through the city for about 29 km (18 mi), the Svitava River cuts a 13 km (8 mi) path through the city. The width of Brno is 21.5 km (13.4 mi) measured from the east to the west and its overall area is 230 km2 (89 sq mi). Within the city limits are the Brno Dam Lake, several ponds, and other standing bodies of water, for example reservoirs in the Marian Valley or the Žebětín Pond. 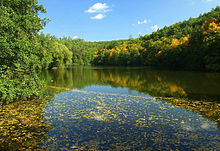 Brno is surrounded by wooded hills on three sides; about 6,379 ha (15,763 acres) of the area of the city is forest, i.e. 28%. Due to its location between the Bohemian-Moravian Highlands and the Southern Moravian lowlands (Dyje-Svratka Vale), Brno has a moderate climate. Compared to other cities in the country, Brno has a very high air quality, which is ensured by a good natural circulation of air; no severe storms or similar natural disasters have ever been recorded in the city. Brno is the former capital city of Moravia and the political and cultural hub of the South Moravian Region. The city has over 400,000 residents. Its urban agglomeration has about 450,000 residents. Its larger urban zone had a population of about 730,000 in 2004 while its greater metropolitan area is home to more than 800,000 people. The estimated population of the South Moravian Region is 1.2 million. According to the Eurostat population estimate Brno had 367,729 inhabitants, which ranks it among the 100 largest cities of the EU. Brno is situated at the crossroads of ancient trade routes which have joined northern and southern European civilizations for centuries, and is part of the Danube basin region. The city is historically connected with Vienna, which lies a mere 110 km (68 mi) to the south. Under the Köppen climate classification, Brno has a oceanic climate (Cfb) for -3 °C original isoterm, but near of the (-2,5 °C average temperature in January, month most cold) or include by updated classification in humid continental climate (Dfb) with cold winters and hot to warm summers. However, in the last 20 years the temperature has increased, and summer days with temperature above 30 °C (86 °F) are quite common. The average temperature is 9.4 °C (49 °F), the average annual precipitation is about 505 mm (19.88 in), the average number of precipitation days is 150, the average annual sunshine is 1,771 hours, and the prevailing wind direction is northwest. The weather box below shows average data between years 1961 and 1990. Its height above sea level varies from 190 m (623 ft) to 425 m (1,394 ft), and the highest point in the area is the Kopeček Hill. By law Brno is a statutory city; it consists of 29 city districts (administrative divisions, cz: Městské části) the highest body of its self-government is the Assembly of the City of Brno (cz: Zastupitelstvo města Brna). The city is headed by the lord mayor (cz: primátor); he or she has right to use the mayor's insignia and represents the city outwards. As of, the lord mayor is Petr Vokřál. The executive body is the city council (cz: Rada města Brna) and local councils of the city districts; the city council has 11 members including the lord mayor and his four deputies. The assembly of the city elects the lord mayor and other members of the city council, establishes the local police, and is also entitled to grant citizenship of honour and the Awards of the City of Brno. The head of the Assembly of the City of Brno in personal matters is the Chief Executive (cz: Tajemník magistrátu) who according to certain special regulations carries out the function of employer of the other members of the city management. The Chief Executive is directly responsible to the Lord Mayor. The city itself forms a separate district the Brno-City District (cz: Okres Brno-město) surrounded by the Brno-Country District (cz: Okres Brno-venkov), Brno is divided into 29 administrative divisions (city districts) and consists of 48 cadastral areas. This might sound confusing but there is a big difference between "a city district of Brno", "the Brno-City District" and "the Brno-Country District". The city districts of Brno significantly varies in their size by both population and area. The most populated city district of Brno is the Brno-Centre which has over 91 thousand of residents and the less populated are Brno-Ořešín and Brno-Útěchov with about 500 residents. By its area the largest one is Brno-Bystrc with 27.24 square kilometres (10.52 sq mi) and the smallest is Brno-Nový Lískovec with 1.66 square kilometres (0.64 sq mi). Brno is the home to the highest courts in the Czech judiciary. The Supreme Court is on Burešova Street, the Supreme Administrative Court is on Moravské náměstí (English: Moravian Square), and the Constitutional Court is on Joštova Street, and the Supreme Public Prosecutor's Office of the Czech Republic is on Jezuitská street. Source: Růžková, J.; Josef Škrabal, J.; et al. (2006). Historický lexikon obcí České republiky 1869–2005 [Historical lexicon of municipalities in the Czech Republic 1869–2005] (PDF) (in Czech). Díl I. Český statistický úřad. pp. 51–54. ISBN 80-250-1311-1. According to the 2011 census, Brno had 385,913 inhabitants. The largest ethnic groups were Czechs (51.6%), Moravians (18.7%), Slovaks (1.5%), Ukrainians (0.9%), Vietnamese (0.4%), and Poles (0.2%). Brno experienced the largest increase in population during the 19th century at the time of the industrial revolution. A slight decrease in population after 1989 was caused by suburbanisation. People wearing the traditional Moravian kroje (Moravian national folk costumes) at a "folk festival" in Líšeň. The city spends about 30 million euro every year on culture. There are many museums, theatres and other cultural institutions. Brno is also a vibrant university city with about 90,000 students, and a number of festivals and other cultural events. Since the 1990s Brno has experienced a great cultural "rebirth": façades of historical monuments are being repaired and various exhibitions, shows, etc., are being established or extended. In 2007 a summit of 15 presidents of the EU Member States was held in Brno. Despite its urban character, some of the city districts still preserve traditional Moravian folklore, including folk festivals with traditional Moravian costumes (cz: kroje), Moravian wines, folk music and dances. Unlike smaller municipalities, in Brno the traditional folk festivals are held locally by city districts: among the city districts where annual traditional Moravian festivals takes place are Židenice, Líšeň, or Ivanovice. Hantec is a unique dialect that originated in Brno. The Cathedral of Saint Peter and Paul and Dietrichstein Palace viewed from the tower of the Old Town Hall. Villa Tugendhat, a masterpiece of the Modern Movement in architecture, designed by architect Ludwig Mies van der Rohe in the 1920s and finished in 1930, now protected as a World Heritage Site by UNESCO. Brno has hundreds of historical sights, including one designated a World Heritage Site by UNESCO, and eight monuments listed among the national cultural heritage of the Czech Republic. Majority of the main sights of Brno are situated in its historical centre. The city has the third largest historic preservation zone in the Czech Republic, the largest one being that of the Czech capital Prague. However, there is a considerable difference in the size of historical preservation zones of both cities. While Brno has 484 legally protected sites, Prague has as many as 1,330. Špilberk Castle, originally a royal castle founded in the 13th century, was from the 17th century a fortress and feared prison (e.g. Carbonari). Today it is one of the city's principal monuments. Similarly important is the Cathedral of St. Peter and Paul. The cathedral was built during the 14th and 15th centuries in place of an 11th-century chapel. In its present form with two neo-Gothic towers it was finished only in 1909. The other large castle near the city is Veveří Castle. Abbey of Saint Thomas is the place where Gregor Mendel established the new science of genetics. Church of Saint Tomas is the final resting place of its founder Margrave of Moravia John Henry of Luxembourg and his son King of the Romans and Margrave of Moravia Jobst of Moravia. Basilica of the assumption of our Lady the final resting place also of its founder Queen Elisabeth Richeza. Church of Saint James is one of the most preserved and most spectacular Gothic churches in Brno. The Vegetable Market with Parnas fountain. Brno Ossuary which is the second largest ossuary in Europe, after the Catacombs of Paris. Another ossuary is Capuchin crypt with mummies of Capuchin monks and some of the notable people of their era, like architect Mořic Grimm or the famous mercenary leader Baron Trenk. The Labyrinth under Vegetable Market, a system of underground corridors and cellars dating back to Middle Ages, has been recently opened to the public. Brno is home to a functionalist Synagogue and the largest Jewish cemetery in Moravia. A Jewish population lived in Brno as early as the 13th century, and remnants of tombstones can be traced back to as early as 1349. The functionalist synagogue was built between 1934 and 1936. While there were 12,000 members of the Brno Jewish community in 1938, only 1,000 survived the Nazi persecution during Germany's occupation in World War II. Today, the cemetery and synagogue are maintained by a Brno Jewish community once again. The only Czech mosque, founded in 1998, is also located in Brno. The era between the world wars brought a building boom to the city, leaving it with many modern and especially functionalist buildings, the most celebrated one being Villa Tugendhat, designed by architect Ludwig Mies van der Rohe in the 1920s for the wealthy family of Fritz Tugendhat, and finished in 1930. It was designated a World Heritage Site by UNESCO in 2001. Another renowned architect who significantly shaped Brno was Arnošt Wiesner. Other functionalist buildings include Avion Hotel and Morava Palace. The Brno Exhibition Centre is the city's premier attraction for international business visitors. Annually, over one million visitors attend over 40 professional trade fairs and business conferences held here. Lužánky is the oldest public park opened in the current Czech Republic, as a public park it was established in the late 18th century. Denis Gardens were founded in the early 19th century and are the first public park in the present-day Czech Republic founded by public administration authorities, while Lužánky Park was founded by the emperor of the Austro-Hungarian Empire. Špilberk Park is classified as a national cultural sight of the Czech Republic as a unique piece of garden architecture. One of Brno's more recent additions is the Brno astronomical clock, pictured in both the linked article and the gallery below. AZ Tower opened in 2013 is with its 111 m currently the tallest building in the Czech Republic. Fireworks festival Ignis Brunensis on the Brno Dam Lake (2010). 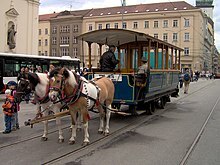 Historical horse-drawn tram at the festival called "Brno - City In the Centre of Europe". The biggest festival held in Brno is the fireworks competition festival Ignis Brunensis (Latin for "Flame of Brno") held annually in June. It is part of a festival with a bold name "Brno - City in the Centre of Europe". Ignis Brunensis is the biggest show of its kind held in Central Europe. usually attracts one or two hundred thousand visitors every day. International film festival Cinema Mundi shows about 60 films competing for Oscar nomination in the category of Best Foreign Language Film. The Theatre World Brno is another international festival annually held in the city where the Brno theatres and the city centre stages around one hundred performances by both national and foreign ensembles. Every September, Brno is home to a wine festival (Slavnosti vína) to celebrate the harvest in the surrounding wine-producing region. The Mahen Theatre, one of the buildings of the National Theatre Brno, built in 1882. Reduta Theatre, it is the oldest theatre in Central Europe. Brno has the oldest theatre building in Central Europe, the Reduta Theatre at Zelný trh (en: the Vegetable Market). So the city has a long tradition in theatre productions, the first theatre plays in Brno took place probably in the 1660s in the City Tavern, today's Reduta Theatre; however, the first "real theatre"[clarification needed] with theatre boxes was built in 1733 in this complex. The first documented professional Czech performance took place in 1767 again in the Reduta Theatre, the play was called Zamilovaný ponocný (en: Watchman in Love) and was performed by the Venice Theatre Company; the same year Mozart performed in the theatre with his elder sister Anna Maria (Nannerl). In that year the Mozart family spent Christmas in Brno, this rare visit is commemorated by a statue of Mozart as a child in front of the Reduta Theatre; also the Reduta's Mozart Hall (cz: Mozartův sál) was named after him. The National Theatre Brno is the leading scene of opera, drama and ballet in the city of Brno. The first permanent seat of the National Theatre Brno was established in 1884 and it was called Národní divadlo v Brně (en: the National Theatre in Brno), today this institution owns the Mahen Theatre, built in 1882, Janáček Theatre built in 1965, and the Reduta Theatre which is Central Europe's oldest theatre. The composer Leoš Janáček is also connected with the National Theatre Brno. Another interesting fact about the National Theatre Brno: the Mahen Theatre was the first theatre building in Europe to be illuminated by Thomas Edison's electric light bulbs; at that time it was a completely new invention and there were no power plants built in the city, so a small steam power plant was built nearby just to power the theatre, and Edison came to Brno in 1911 to see it. The most commercially successful theatre in Brno is the Brno City Theatre, founded in 1945; its performances are usually sold out. They also stage about 150 performances abroad every year. Repertoire of this theatre consists primarily of musical and dramatical scene. There is a variety of smaller theatres in Brno, such as Divadlo Bolka Polívky, Divadlo Husa na provázku, HaDivadlo, loutkové divadlo Radost, Divadlo Polárka, G Studio, Divadlo v 7 a půl – Kabinet múz, Divadlo Vaňkovka for children, etc. Theatres in Brno experienced a long development[clarification needed] and the current seats[clarification needed] of the theatres and their artistic ensembles might[clarification needed] be considerably different from the original ones, for example the Mahen Theatre was originally called the City Theatre and until 1918 it performed exclusively in German and also it was not part of the National Theatre in Brno, there was similar situation regarding the Reduta Theatre. Between 1971 and 1978 some plays were performed at the Brno Exhibition Centre due to reconstruction of the Mahen Theatre. There are several legends connected with the City of Brno; one of the best known is the Legend of the Brno Dragon. It is said that there was a terrible creature terrorizing the citizens of Brno. The people had never seen such a beast before, so they called it a dragon. They trembled in fear of the dragon until a brave man decided to kill the monster by tricking it into eating a carcass filled with lime. In reality the dragon was a crocodile, the preserved body of which is now displayed at the entrance of the Old Town Hall. Crocodile and dragon motifs are common in Brno. A "krokodýl" (crocodile in Czech language) is the local stuffed baguette, and the city radio station is known as Radio Krokodýl. Local baseball team is named Draci Brno (en: Dragons Brno) and local rugby club is named RC Dragon Brno, there is also local American football team called Brno Alligators. Intercity train connecting Brno and Czech capital city Prague is called Brněnský drak (en: Brno dragon). Next to the "dragon" at the Old Town Hall the town's second well-known emblem is displayed. This is a wagon wheel made from a tree found and felled fifty miles away from the city. According to the story, a local man wagered to fell the tree, to make a wheel out of it, and to roll the wheel to the city of Brno, all this within a single day. Since the whole achievement was considered impossible by normal human means, the man was later believed to have called on the devil for assistance, and he died in poverty as a result. As a historic memento to victory over the Swedish army in 1645, the local Petrov Cathedral rings noon an hour earlier, at 11 o'clock because the locals and Swedish army were in stalemate and the Swedish general said he would withdraw if his army had not won by noon; the bell ringer tricked him by ringing the bell an hour early. Keeping his word, the general and his army left. The most significant museum in Brno is the Moravian Museum which is the largest and the biggest museum in Moravia and the second in the Czech Republic. The museum was founded in 1817 and its collections include over 6 million objects. The biggest public library in Brno is the Moravian Library, it's the second largest library in the Czech Republic with about 4 million volumes. The biggest gallery in Brno is the Moravian Gallery and again it is the second largest institution of its kind in the Czech Republic and the biggest in Moravia. There is also a particular section of the Moravian Museum related to the oldest history of mankind and prehistoric Europe called Anthropos. There is also a Technical Museum which is the largest in Moravia and one of the largest in Czech Republic. The permanent expositions of the Technical Museum in Brno show the advance of science and technology, accompanied by various realistic models and restored machines. Short-term exhibitions of many different points of interest are also often held here. Over the past two decades Brno evolved into an important university city, the number of students of higher education institutions reached 89,000 in 2010. The city also became home to a number of institutions directly related to research and development, like the Central European Institute of Technology (CEITEC), or the International Clinical Research Center in Brno (ICRC). The city is also gaining importance in various fields of engineering, especially in software development, there is a number of companies focused on development operating in Brno. For example, AVG Technologies (headquarters), IBM (Client Innovation Centre Brno), AT&T (American Telephone and Telegraph) Honeywell (Honeywell Global Design Center Brno), Siemens, SGI (CZ headquarters), Red Hat (CZ headquarters), Motorola, etc. With over 40,000 students, Masaryk University is the largest university in Brno and the second biggest in the Czech Republic. Today, it consists of nine faculties, with more than 190 departments, institutes and clinics. It is one of the most significant institutions for education and research in the Czech Republic and a respected Central European university. The Brno University of Technology was established in 1899. Today with over 20,000 students it ranks among the Czech's biggest technical universities. Viktor Kaplan, inventor of the Kaplan turbine, spent nearly 30 years at German Technical University in Brno (which ceased to exist in 1945 and its property was transferred to Brno University of Technology). Mendel University, named after the founder of genetics Gregor Mendel who created his revolutionary scientific theories in Brno, has roughly 10,000 students. Janáček Academy of Music and Performing Arts, named after Leoš Janáček, was founded in 1947 and is one of two academies of music and drama in the Czech Republic. It holds the annual Leoš Janáček Competition. The town has a long history of motor racing, among other events, the Masaryk Circuit hosts the prestigious Moto GP championship (since 1965). The annual Czech Republic motorcycle Grand Prix is the most famous motor race in the Czech Republic, it is held here since 1950. Since 1968, Brno has been a permanent fixture on the European Touring Car Championship (ETCC) series. 2010 FIBA World Championship for Women, where Czech squad managed to achieve silver medal, was played in Brno's Arena Vodova. There is also a horse-race course at Brno-Dvorska and an aeroclub airport in Medlánky. Several sports clubs play the highest Czech league, respectively. For example, (football) FC Zbrojovka Brno, (ice hockey) HC Kometa Brno, (handball) KP Brno, (basketball) BC Brno (men) and BK Brno (women), four baseball teams (Draci Brno, Hroši Brno, VSK Technika Brno, MZLU Express Brno), lacrosse team Brno Ravens Lacrosse Club, American football team (Brno Alligators), two rugby teams (RC Dragon Brno, RC Bystrc) and others. Tennis player Lucie Šafářová comes from Brno as well as Lukáš Rosol, who managed to beat top-player Rafael Nadal in the second round of the 2012 Wimbledon Championships. Michal Březina, one of the best Czech figure skaters, also comes from Brno. Tram service is the backbone of the public transport in Brno. The Brno-Tuřany Airport is the second busiest airport in the Czech Republic. Public transport in Brno consists of 12 tram lines (1 historic with old tram), 14 trolleybus lines (the largest trolleybus network in the Czech Republic) and almost 40 day and 11 night bus lines. Trams (often called Šaliny by the locals ) have a long tradition in Brno; they first appeared on the streets in 1869; this was the first operation of horse-drawn trams in the current Czech Republic. The local public transport system is interconnected with regional public transport in one integrated system called IDS JMK, and also directly connects several nearby municipalities with the city. Its main operator is the DPmB company (Brno City Transport Company) which also operates a ferry route, mainly recreational, at the Brno Dam Lake. There is a tourist minibus providing a brief tour of the city. The city also plans to build a metro system light rail system to alleviate overcrowding of trams and to reduce the congestion on the surface. Railway transport started to operate in the city in 1839 on the Brno–Vienna line; this was the first operating railway line in the current Czech Republic. Today's Brno is a railway junction of supranational importance; for passenger traffic there are nine stations and stops. The current main railway station is the central hub of regional train services; every day about 50,000 passengers use it and 500 trains pass through it; it is currently operating at full capacity. The current main station building is outdated and lacks sufficient operating capacity, but the construction of the new station has been postponed several times for various reasons. A Central station referendum was due on 7 and 8 October 2016, the same day as regional elections. Road transport makes Brno an international crossroad of highways. There are two motorways on the southern edge of the city, D1 leading to Ostrava and to Prague and D2 leading to Bratislava. Not far from the city limits there is also one expressway, R52, leading to Vienna; another expressway, R43, which will connect Brno to northwestern Moravia, is planned. The city is gradually building the large city ring road (road I/42), several road tunnels were built (Tunnels Pisarky, Husovice, Hlinky and Královopolský) and more tunnels are planned. Also, due to the congestion in private transport the city continues to strive to build more parking ramps including underground ones, but this effort has not always been successful. Air transport is enabled by two functional airports. One of them is a public international airport Brno-Tuřany Airport. The airport has seen a sharp increase in passenger traffic up to 2011, however the amount of served passengers has been since in decline with the only remaining scheduled flights being to London and Munich. As an attempt to reverse the situation, Brno-Tuřany Airport is to serve as the base for the Brno-based airline Blue Air Moravia a subsidiary of Blue Air that is set to begin operations in March 2018, with plans for scheduled service to Barcelona, Brussels, Milan, Lviv and Rome. The airport also serves as one of the two bases for police helicopters in the Czech Republic. The other airport, Medlánky Airport, is a small domestic airport serving mainly recreational activities such as flying hot air balloons, gliders or aircraft RC models. Cycling is widespread in Brno also due to lowland nature of the landscape. Existing tracks for cycling and roller skating in 2011 measured in total approximately 38 kilometres (24 mi) and are gradually being expanded. And there is also one long bikeway leading to Vienna, which is one of Brno's sister cities, the track is approximately 130 kilometres (81 mi) long. Several hiking trails of the Czech Tourist Club also pass through Brno. This tool shows only cities with population over 300,000 in radius of 300 km (186.41 mi). ^ This led to decline in population of Olomouc from over 30,000 people to mere 1,675 and total devastation of the city. ^ However, Olomouc also had legal status of capital city, although this title was purely a honorary matter rather than a real role, sometimes it was referred to as "the Secondary Capital". ^ The cathedral of the bishopric of the Roman Catholic Diocese of Brno, the Cathedral of St. Peter and Paul, is depicted on the 10CZK coin. ^ "History of the City of Brno – Statutory city of Brno" (in Czech). The Statutory city of Brno. Archived from the original on 15 January 2010. Retrieved 6 September 2011. ^ a b c d e f "Where in the world is Brno? - Statutory city of Brno" (in Czech). The Statutory city of Brno. Archived from the original on 2 September 2011. Retrieved 6 September 2011. ^ Počet brněnských obyvatel je záhada? ^ "Brno". Dictionary.com Unabridged. Random House. Retrieved 16 March 2014. ^ a b c d "Adresy v České republice: Brno" (in Czech). Ministry of the Interior of the Czech Republic. Archived from the original on 30 August 2013. Retrieved 23 January 2011. ^ a b "Urban Audit: City Profiles – Brno". Archived from the original on 9 November 2011. ^ "The Public Defender of Rights". Retrieved 7 September 2011. ^ "Office for the Protection of Competition". Retrieved 7 September 2011. ^ "Informace o společnosti - Veletrhy Brno" (in Czech). Retrieved 24 September 2011. ^ "Basic Info – BVV Trade Fairs Brno". Retrieved 7 September 2011. ^ "1930 – 1986 Automotodrom Brno". Archived from the original on 4 September 2011. Retrieved 7 September 2011. ^ "ABOUT THE FESTIVAL". Retrieved 7 September 2011. ^ a b "Celková návštěvnost festivalových akcí" (in Czech). Retrieved 5 May 2014. ^ a b "Weekend trip tip: hike to Veveří castle, take a ferry boat back to Brno". Retrieved 7 September 2011. ^ "Veverské pověsti a legendy" (in Czech). Archived from the original on 26 September 2013. Retrieved 7 September 2011. ^ "Old Town Hall of Brno – Brno Tourist Informations". Retrieved 7 September 2011. ^ "Introduction – Vila Tugendhat". Archived from the original on 29 July 2011. Retrieved 7 September 2011. ^ "Brno | Creative Cities Network". en.unesco.org. Retrieved 3 October 2018. ^ E.M. Pospelov, Geograficheskie nazvaniya mira (Moscow, 1998), p. 82. ^ "What does Brunn mean?". AudioEnglish.org. Retrieved 26 October 2015. ^ "WordNet Search". WordNet. Retrieved 26 October 2015. ^ a b c d "History of the City of Brno". the Statutory city of Brno. Archived from the original on 28 September 2011. Retrieved 30 September 2011. ^ "Naučná stezka Hády a údolí Říčky. Panel 14: Staré Zámky" (PDF) (in Czech). ZO ČSOP Pozemkový spolek Hády. Archived from the original (PDF) on 18 July 2011. Retrieved 30 September 2011. ^ Čapka, František (2003). "Ota Olomoucký a Konrád Brněnský". Morava. Stručná historie států (in Czech). Praha: Libri. p. 30. ISBN 80-7277-186-8. ^ a b c "Spilberk Castle — Špilberk, Brno Castle, the home of Brno City Museum". Retrieved 30 September 2011. ^ "Opatství svatého Tomáše na Starém Brně". Retrieved 3 October 2011. ^ Garstein, Oskar (1992). Rome and the Counter-Reformation in Scandinavia: The age of Gustavus Adolphus and Queen Christina of Sweden, 1622–1656. BRILL. ^ "Moravské desky zemské" (in Czech). Ministerstvo vnitra České republiky. Retrieved 3 October 2011. ^ "Brno – Historie v datech" (in Czech). Retrieved 28 September 2011. ^ "Napoleon I. in Moravia's capital in 1809, Brno, Czech Republic - La Famille Bonaparte on Waymarking.com". Retrieved 28 September 2011. ^ a b "První parní vlak do dnešního Česka přijel z Vídně do Brna — Doprava — ČT24 — Česká televize" (in Czech). ČT. Retrieved 6 September 2011. ^ a b "Dopravní podnik města Brna, a.s. Historie" (in Czech). DPmB. Retrieved 6 September 2011. ^ a b c Eva Hahn, Hans Henning Hahn: Die Vertreibung im deutschen Erinnern. Legenden, Mythos, Geschichte. Schöningh, Paderborn 2010, ISBN 978-3-506-77044-8, p. 370. ^ "Výstava Velké Brno" (in Czech). Retrieved 2 October 2011. ^ "Statistické údaje za Zemi Moravskoslezskou k roku 1930" (PDF) (in Czech). Archived from the original (PDF) on 18 July 2011. Retrieved 2 October 2011. ^ "Zákon č. 213/1919 Sb., o sloučení sousedních obcí s Brnem" (in Czech). Archived from the original on 20 May 2011. Retrieved 2 October 2011. ^ JUDr. František Vašek. "Kounicovi koleje v Brně". zasvobodu.cz (in Czech). Archived from the original on 8 March 2008. Retrieved 30 January 2014. ^ Leoš Drahota: Naše šibenice 16 - Novodobé věšení, ISSN 1213-6905 "Exekuce v Kounicových kolejích byly veřejné, ale vstup byl možný, podobně jako v případě nějaké kulturní či sportovní akce, jen s platnou vstupenkou, prodávanou za tři marky." ^ Klementová, Táňa (2010). "Poslední nástupiště Brněnské transporty židů v letech 1941–1945" (PDF). Retrieved 5 May 2014. ^ Vlček, Martin (24 May 2008). "Spojenecké nálety na Brno v letech 1944-1945". Retrieved 4 May 2014. ^ Bundesministerium für Vertriebene, Flüchtlinge und Kriegsgeschädigte & Theodor Schieder eds. : Die Vertreibung der Deutschen aus Ost-Mitteleuropa. Vorarbeiten Fritz Valjavec. Teil 4: Die Vertreibung der deutschen Bevölkerung aus der Tschechoslowakei. Bonn, 1957, 2 Bände. ^ a b "Zákon 208/1948 Sb. o krajském zřízení" (PDF) (in Czech). Archived from the original (PDF) on 28 September 2011. Retrieved 2 October 2011. ^ "280/1948 Sb. Zákon o krajském zřízení" (in Czech). Retrieved 2 October 2011. ^ a b "Geografické údaje a obyvatelstvo - Statutární město Brno" (in Czech). Archived from the original on 23 May 2011. Retrieved 8 September 2011. ^ "South Moravia – Official Tourism Website". Retrieved 8 September 2011. ^ "Vyhláška 561/2006 Sb. : seznam aglomerací pro účely hodnocení a snižování hluku" (in Czech). Portál veřejné správy České republiky. 2006. Archived from the original on 18 July 2011. Retrieved 8 September 2011. ^ "Základní tendence vývoje Jihomoravského kraje v roce 2010" (PDF) (in Czech). Český statistický úřad. 2010. Retrieved 8 September 2011. ^ "Total population in Urban Audit cities – Core city". Retrieved 8 September 2011. ^ "Brno, Czech Republic Köppen Climate Classification (Weatherbase)". Weatherbase. Retrieved 13 November 2018. ^ Peel, M. C.; Finlayson B. L.; McMahon, T. A. (2007). "Updated world map of the Köppen–Geiger climate classification" (PDF). Hydrol. Earth Syst. Sci. 11: 1633–1644. doi:10.5194/hess-11-1633-2007. ISSN 1027-5606. ^ "World Weather Information Service – Brno". World Meteorological Organization. May 2011. Retrieved 28 February 2013. ^ "Brno Climate Normals 1961–1990". National Oceanic and Atmospheric Administration. Retrieved 28 February 2013. ^ "Basic data on city districts offices". The Statutory city of Brno. Archived from the original on 23 May 2011. Retrieved 22 September 2011. ^ a b "Assembly of the City of Brno". The Statutory city of Brno. Archived from the original on 23 May 2011. Retrieved 22 September 2011. ^ "Executive Board, Brno City Council". The Statutory city of Brno. Archived from the original on 21 October 2010. Retrieved 22 September 2011. ^ "Elected bodies". The Statutory city of Brno. Archived from the original on 23 May 2011. Retrieved 22 September 2011. ^ "Tajemník Magistrátu města Brna" (in Czech). The Statutory city of Brno. Retrieved 22 September 2011. ^ "The Supreme Court of the Czech Republic". Archived from the original on 27 September 2011. Retrieved 8 September 2011. ^ "The Supreme Administrative Court". Retrieved 8 September 2011. ^ "The Constitutional Court of the Czech Republic". Retrieved 8 September 2011. ^ "Nejvyšší státní zastupitelství - Introduction". Retrieved 8 September 2011. ^ "Základní výsledky". Český statistický úřad. 2011. Retrieved 24 July 2013. ^ "Schválený rozpočet provozních a kapitálových výdajů - Rekapitulace dle oddílů a paragrafů" (in Czech). Retrieved 28 September 2011. ^ "Souhrnný rozpočet statutárního města Brna na rok 2010 - Rozpočet výdajů statutárního města Brna" (in Czech). Retrieved 28 September 2011. ^ "Reference – Moravia Convention Bureau" (in Czech). Retrieved 26 September 2011. ^ "Židenické hody - Brno Židenice - www.kalendarakci.atlasceska.cz" (in Czech). Retrieved 26 September 2011. ^ "Líšeňské hody – portál vlisni.cz" (in Czech). Retrieved 26 September 2011. ^ "ČÍ JSOU HODY? NAŠE! » Městská část Brno Ivanovice" (in Czech). Retrieved 26 September 2011. ^ a b "Tugendhat Villa in Brno – UNESCO World Heritage Centre". UNESCO World Heritage Centre. Retrieved 21 September 2011. ^ "Světové dědictví, NKP, chráněná území – okres Brno-město" (in Czech). The National Institute for the Protection and Conservation of Monuments and Sites of the Czech Republic. Retrieved 21 September 2011. ^ "Kulturní památky" (in Czech). The Ministry of the interior of the Czech Republic. Retrieved 21 September 2011. ^ "Národní památkový ústav: Světové dědictví, NKP, chráněná území" (in Czech). The National Institute for the Protection and Conservation of Monuments and Sites of the Czech Republic. Retrieved 21 September 2011. ^ "Spilberk Castle – history". Spilberk.cz. Retrieved 4 March 2010. ^ Statutory city of Brno. "City of Brno – Cathedral of Saints Peter and Paul". Archived from the original on 10 May 2009. Retrieved 4 March 2010. ^ "Brno Ossuary located in Brno, Czech Republic". Atlas Obscura – Curious and Wondrous Travel Destinations. Retrieved 21 September 2011. ^ "Capuchin Crypt". The Capuchin Monastery in Brno. Archived from the original on 25 April 2012. Retrieved 21 September 2011. ^ a b c "The History of the Jewish Community in Brno" (in Czech). Web.archive.org. 27 September 2007. Archived from the original on 27 September 2007. Retrieved 4 March 2010. ^ "Mešita Brno" (in Czech). Archived from the original on 23 May 2011. Retrieved 4 October 2011. ^ "Brno – Funkcionalismus a moderní architektura" (in Czech). Archived from the original on 28 September 2011. Retrieved 21 September 2011. ^ "Tvorba architekta funkcionalismu Fuchse přinesla novou estetiku - iDNES.cz" (in Czech). Retrieved 21 September 2011. ^ Statutory city of Brno. "City of Brno – Villa Tugendhat". Archived from the original on 10 February 2013. Retrieved 4 March 2010. ^ "Tourist Portal of the Czech Republic – Interwar architecture in Brno". Czecot.com. 15 February 2006. Retrieved 4 March 2010. ^ webProgress.cz. "The Chamber of Tax Advisers of the Czech Republic – Some information about Brno". Kdpcr.cz. Archived from the original on 18 July 2011. Retrieved 4 March 2010. ^ "Park Lužánky - Statutární město Brno" (in Czech). Statutory City of Brno. Retrieved 21 September 2011. ^ "park Denisovy sady – Přehled kulturních památek - Statutární město Brno" (in Czech). Statutory City of Brno. Archived from the original on 10 February 2013. Retrieved 21 September 2011. ^ "Park Špilberk - Statutární město Brno" (in Czech). Statutory City of Brno. Retrieved 21 September 2011. ^ "About the festival". Retrieved 24 September 2011. ^ "Brno chystá velkolepé ohňostroje, festival by mohl vidět milion diváků" (in Czech). Retrieved 26 September 2011. ^ "Brno – Concentus Moraviae" (in Czech). Retrieved 26 September 2011. ^ "About the festival / About the festival / Cinema Mundi returns to Brno after one year - www.cinemamundi.info". Retrieved 26 September 2011. ^ "Festival – DIVADELNÍ SVĚT BRNO". Archived from the original on 2 April 2012. Retrieved 26 September 2011. ^ "Moravian autumn – Introduction". Archived from the original on 5 October 2008. Retrieved 26 September 2011. ^ "Spilberk Festival – Brno Philharmonic Orchestra". Archived from the original on 9 January 2016. Retrieved 26 September 2011. ^ "Welcome to Summer Shakespeare Festival 2011, Summer Shakespeare Festival 2011, AGENTURA SCHOK, spol. s r.o., Praha". Retrieved 26 September 2011. ^ "Slavnostivina". www.slavnostivina.cz. Retrieved 4 March 2010. ^ a b "Historie Mahenova divadla, Národní divadlo Brno" (in Czech). The National Theatre Brno. Archived from the original on 18 November 2011. Retrieved 21 September 2011. ^ a b c "Historie divadla Reduta, Národní divadlo Brno" (in Czech). The National Theatre Brno. Archived from the original on 6 March 2012. Retrieved 21 September 2011. ^ "Brno – Mozart v Brně" (in Czech). The Statutory City of Brno. Retrieved 22 September 2011. ^ "Divadlo Reduta, Mozartův sál, Národní divadlo Brno" (in Czech). The National Theatre Brno. Retrieved 22 September 2011. ^ "Opera, Národní divadlo Brno". The National Theatre Brno. Retrieved 22 September 2011. ^ "Drama, Národní divadlo Brno". The National Theatre Brno. Retrieved 22 September 2011. ^ "Ballet, Národní divadlo Brno". The National Theatre Brno. Retrieved 22 September 2011. ^ "Buildings, Národní divadlo Brno" (in Czech). The National Theatre Brno. Retrieved 21 September 2011. ^ "Leoš Janáček a Národní divadlo v Brně 1884-1928, Národní divadlo Brno" (in Czech). The National Theatre Brno. Archived from the original on 10 March 2012. Retrieved 21 September 2011. ^ "Městské divadlo Brno – Theatre / History". The Brno City Theatre. Archived from the original on 4 August 2012. Retrieved 22 September 2011. ^ "Městské divadlo Brno – Theatre / Today". The Brno City Theatre. Archived from the original on 3 September 2012. Retrieved 22 September 2011. ^ "Městské divadlo Brno – Performances". The Brno City Theatre. Archived from the original on 4 August 2012. Retrieved 22 September 2011. ^ "Fenomén Městského divadla v Brno v brněnské kultuře" (PDF) (in Czech). Masarykova univerzita, Filozofická fakulta, Ústav hudební vědy. Retrieved 22 September 2011. ^ "Old Town Hall of Brno – Brno Tourist Informations". Retrieved 24 September 2011. ^ Henig 2000, p. 93. ^ a b "The Moravian Museum". Archived from the original on 27 September 2011. Retrieved 26 September 2011. ^ "About the Library". The Moravian Library in Brno. Retrieved 26 September 2011. ^ "The Moravian Gallery in Brno – History". Retrieved 26 September 2011. ^ "CEITEC". Retrieved 4 October 2011. ^ "FNUSA ICRC". Retrieved 23 July 2013. ^ "AVG Antivirus and Security Software – Contact us". Retrieved 4 October 2011. ^ "IBM Governmental Programs – Delivery Centre Central Eastern Europe in Brno". Retrieved 4 October 2011. ^ "Honeywell Global Design Center Brno – Honeywell Czech Republic". Archived from the original on 13 September 2011. Retrieved 4 October 2011. ^ "Brno – – Siemens" (in Czech). Archived from the original on 25 April 2012. Retrieved 4 October 2011. ^ "SGI – Global – Česká Republika" (in Czech). Retrieved 4 October 2011. ^ "Red Hat Europe". Retrieved 4 October 2011. ^ "MOTOROLA – Technology Park Brno". Archived from the original on 29 May 2012. Retrieved 4 October 2011. ^ "Marasyk University, Brno". Archived from the original on 20 January 2012. Retrieved 4 October 2011. ^ "Brief history of the Masaryk University". Retrieved 2 October 2011. ^ "Janáček Academy – history". Retrieved 4 March 2010. ^ "Janáček Academy – Leoš Janáček Competition". Hf.jamu.cz. Retrieved 4 March 2010. ^ "Portál Jihomoravského kraje - Základní údaje o Jihomoravském kraji - Základní údaje o Jihomoravském kraji" (in Czech). Retrieved 26 September 2011. ^ "Timetable of IDS JMK". Retrieved 7 September 2011. ^ "IDS JMK – Integrated public transport system in the City of Brno and the Southern Moravia Region". Retrieved 7 September 2011. ^ "Dopravní podnik města Brna, a.s." Retrieved 7 September 2011. ^ "Brněnské "metro" už je na stole úředníků kraje, peníze na ně nejsou - iDNES.cz" (in Czech). Retrieved 6 September 2011. ^ "Na brněnské "metro" chybí už jen peníze" (in Czech). vz24.cz. Retrieved 6 September 2011. ^ a b "Hlavní nádraží v Brně není nafukovací, některé vlaky proto končí v Židenicích" (in Czech). iDNES.cz. Retrieved 6 September 2011. ^ a b Roads and Motorways in the Czech Republic 2009 (PDF). The Czech Road and Motorway Directorate. 2009. Archived from the original (PDF) on 21 February 2011. ^ "Velký městský okruh Brno (VMO Brno) – Úseky VMO Brno" (in Czech). Ředitelsví silnic a dálnic ČR. Retrieved 7 September 2011. ^ "S firmou, která měla stavět parkovací domy, Brno neprodlouží smlouvu" (in Czech). iDNES.cz. Retrieved 7 September 2011. ^ "Blue Air to fly Paris CDG – Turin, establishes Blue Air Moravia in Brno". worldairlinenews.com. 1 January 2018. Retrieved 18 January 2018. ^ "Aeroklub Brno Medlánky" (in Czech). Retrieved 7 September 2011. ^ "Stránky medláneckých leteckých modelářů" (in Czech). Archived from the original on 25 December 2009. Retrieved 7 September 2011. ^ "Zajímavosti: Circa urbem Brunensis 2. – Netopýrky za Komínem" (in Czech). MAGAZÍN LETIŠTĚ ČESKÉ REPUBLIKY. Retrieved 7 September 2011. ^ "Brno na kole » Změny města v roce 2010" (in Czech). Retrieved 6 September 2011. ^ "O nás - Cyklostezka Brno Vídeň" (in Czech). Retrieved 6 September 2011. ^ "City of Brno Foreign Relations – Statutory city of Brno" (in Czech). City of Brno. 2003. Archived from the original on 15 January 2016. Retrieved 6 September 2011. ^ "Sister cities of Kharkov". kharkov.vbelous.net (in Russian). Retrieved 4 May 2007. ^ "Leeds – Brno partnership". Leeds.gov.uk. Archived from the original on 1 January 2009. Retrieved 14 October 2008. ^ "Poznań - Miasta partnerskie". 1998–2013 Urząd Miasta Poznania (in Polish). City of Poznań. Archived from the original on 23 September 2013. Retrieved 11 December 2013. ^ "Poznań Official Website – Twin Towns". (in Polish) 1998–2008 Urząd Miasta Poznania. Retrieved 29 November 2008. Wikimedia Commons has media related to Brno. Wikisource has the text of the 1911 Encyclopædia Britannica article Brünn. Wikivoyage has a travel guide for Brno. Living in Brno - English News for foreigners. Linked to many international social groups in the city. Brno at the official website of the Czech Republic.